17th: Something Rare – What colour do you rarely eat? Make something that colour! I eat a lot of different colours quite regularly, I love colourful meals. Though definitely some more than others. I had already used pink for my sad attempt at a monochrome meal, and it was also the base of my multicolour meal. Maybe I don't use so much yellow, but I had just used that for my colour contrast meal. I do eat brown food, but probably not that much and certainly only as a smaller part of a meal. So the only thing for it was to just eat a whole bunch of brown food all day long. For MoFo. After a breakfast of peanut butter on toast, I turned my thoughts to lunch. Foodmill is a local company that makes pies, sausage rolls and other baked goods. I recently picked up a bunch of their frozen pies on special, so decided to give the Mushroom Pie a go. 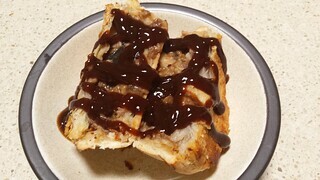 Served with some HP sauce, for maximum brown. The verdict? Meh. 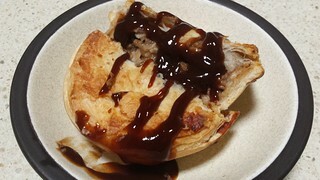 Unfortunately the filling of the pie lacked that really mushroom flavour that I was after. I have another four flavours of pie in the freezer, but in future I will stick to their absolutely delicious custard tarts. My afternoon snack was much better. 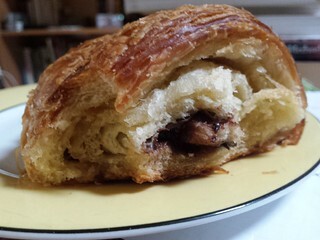 I was in Melbourne at the beginning of the month (I will have full posts of all the food I ate down there once MoFo is over), and I brought home a chocolate croissant from Smith & Deli. They make the greatest croissants! So flaky, so buttery. I just wish there was a bit more chocolate filling. I'll admit, dinner did deviate from the entirely brown theme. But I won't talk about that here, that was for another MoFo prompt! But then I was back on track for dessert. I picked up a couple of bars of Seed & Bean chocolate in Melbourne, and got another couple as a birthday gift from my friend Jess. Chocolate is brown! 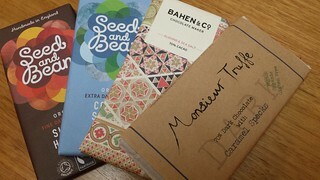 I ate the Monsieur Truffle one, which was nice and crunchy from the little toffee bits inside a nice dark chocolate. What is your favourite brown food? 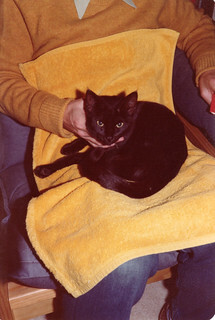 A photo of a young Mo, my first ever cat. Apparently she loved to sit on her 'lap blanket', which was an old towel. Definitely chocolate for me! I like your interpretation of the prompt. That croissant looks wonderful. Everything I see on Aussie blogs from Smith & Deli always looks so good. Smith & Deli is probably my favourite place to eat in Australia. In fact, definitely. It is so amazing. I love filled croissants. I had some amazing savoury filled croissants from there as well, though they will have to wait for my Melbourne post once MoFo is done! Brown foods are my fave!! I probably eat more brown food than anything. Haha. That croissant looks fab. And you can never go wrong with chocolate. A lot of the best foods do seem to fall into the brown category! My favourite brown food is undoubtedly chocolate. I love those Seed & Bean bars - we can't find them here (but we have Justin's pb cups!). That's too bad about the mushroom pie, it sounds so promising! Chocolate is an awesome brown food. XD I wish I had some right now even.